We’d love your help. 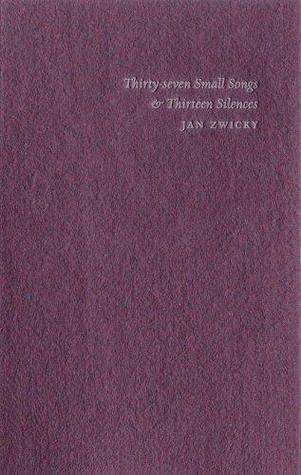 Let us know what’s wrong with this preview of Thirty-Seven Small Songs & Thirteen Silences by Jan Zwicky. To ask other readers questions about Thirty-Seven Small Songs & Thirteen Silences, please sign up. and the breezes fold themselves among the leaves. The last thrush-song has soaked into the earth. in the clearing by the porch. We have bodies, we have eyes! The frog sings in the night. rustling in the dewy grass. The door to the season stands ajar. grass ripens in the flat stones of the walk. of cloud shadow, even at mid-day. This was a library book that I may need to get my own copy of. All of the pieces in this volume were short; most just one or two stanzas. But in that space they managed the magic poetry trick of taking my brain outside of itself. I really love her work. Jan Zwicky’s books of poetry include Songs for Relinquishing the Earth, which won the Governor General’s Award, Robinson’s Crossing, which won the Dorothy Livesay Prize, and, most recently Forge, which was short-listed for the Griffin Prize. Her books of philosophy include Wisdom & Metaphor, Lyric Philosophy, and Alkibiades’ Love (forthcoming 2015).